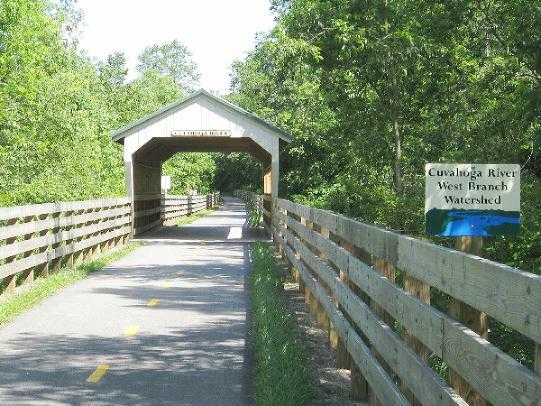 Chardon, OH - "The City of Chardon is seeking public comment for the Maple Highlands Trail Phase II. "This phase of the Maple Highlands Trail will complete the final 0.86-mile section of the Geauga County Maple Highlands Trail network through the City of Chardon. Middlefield, OH - According to geaugamapleleaf.com, the unpaved Middlefield portion of the Maple Highlands Trail is being paved and should be completed by the end of the month. The trail currently has 6.8 unpaved miles, with a 2-mile section close to Middlefield. It will be interesting to see how much of this section receives asphalt. Property acquisition, environmental assessments and surveying will soon be underway in preparation for future trail construction that will close the gap in the trail in Chardon, Ohio. If everything goes as planned, trail design will begin in 2018, with construction slated for sometime in 2019. From news-herald.com, "The good news is the city was conditionally awarded an Ohio Department of Transportation grant of $435,991 toward design, engineering and some construction of Phase 2. "'If everything goes favorably, we will get the money,' said City Manager Randy Sharpe..."
Facilities: Restrooms available at the 4 parks along the trail. Worth Noting: Only ~2 miles of 6.8-mile southern section are plotted on the Google map at this time. This segment connects with the paved trail at Headwaters Park. And extends south through Middlefield and over to the Swine Creek Reservation. Any type of bike can navigate this trail, which is primarily a converted railroad bed. At this time, it is a stand-alone biking trail consisting of two sections, and one must navigate Chardon Square on his own to get from one to the other. This part of the Maple Highlands Trail extends from Water St. (Rt. 6) north to Girdled Road [Final .4-mile segment is Lake Metroparks Trail in Lake County]. Much of it runs between route 44 and the tree line that runs between it and some housing areas. There are also some sections that slip into the wooded area, also. 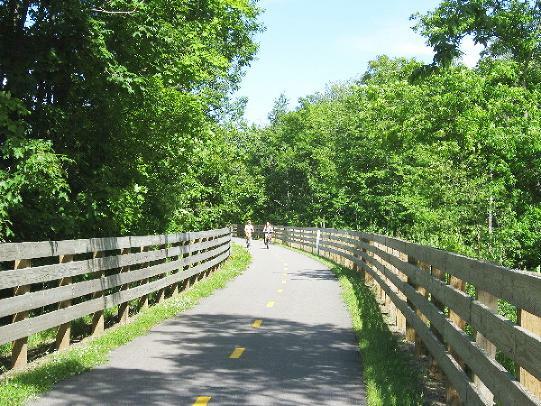 At the end of the trail, by riding east on Girdled Road and then north on Ravenna Road, one can connect with the Lake Metroparks Greenway, which heads straight north into Painesville. This section extends from South Street to Headwaters Park on Old State Road (Rt. 608) in Claridon. Heading east, then southeast from South Street, the trail makes its way alongside this pleasant country town and is shared by hikers, dog walkers and inline skaters. Covered bridges cross over two roads and a creek, and then it becomes very straight, reminiscent of its origins as a railroad track, and becomes a rural ride. Due to the trees that line both sides throughout most of the route, it is pleasantly shady, with open fields and farmlands visible at times. There are six road crossings, two of them Old State Road (Rt.608) and Mayfield Road (Rt. 322) fairly well-traveled but well-marked. One might encounter bikers of many types along this route, from families with young children to teens to couples as well as more serious, solo bikers. The southern portion of this segment of trail ends at Headwaters Park, a Geauga County park with hiking trails and a reservoir for fishing and boating.